It is the one and only plot I own. This wine is called that way because the plot is located on one of the last lava flow that has happened in Auvergne. The volcanic eruption from the “Puy de la Nugère” created a lava flow starting from the top of Volvic’s hill up to the south of Riom. You can download the specification sheet in PDF. Located in Ménétrol. Soil : green clay and basalt on the surface. 10 years old for the young syrah grown from a « massal selection», selection of old vines from the parcel and 80 years old for the old syrah and gamay. Hand harvested grapes in 18kg crates. Whole bunches in a fibreglass vat, daily punch-down during 15 days. Devatting, pressing and blending of the free-run and pressed juice. No added chemical inputs. In 600 litres barrels for 18 months. No filtration and no added sulfites. 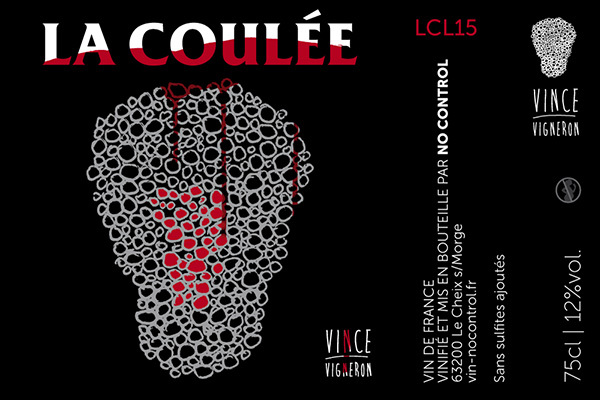 Decanting recommended, temperature of 16°C. 75 cl et magnum bottles.